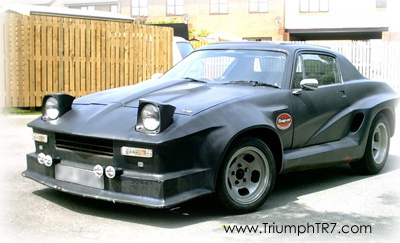 The Beast - A TR7v8 with a difference! For those who want something different, but don't want the plastic look that comes with some of the wilder Grinnall conversions, how about this one-off? 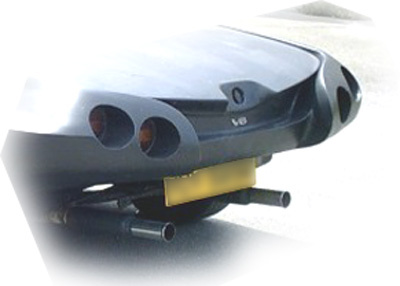 It is completely unique and unlike most body kits this has been fabricated from metal, rather than fibre-glass. And it knocks spots off the F40-replica kits!! From the front - with a lack of bumper - the vehicle doesn't look that different from the LeMans entrant developed by ADA/Janspeed. But after that? Well what can you say? The rear-end is very radical. This won't be to everyone's taste but you cannot deny that it is very eyecatching and would provoke much discussion. The matt-black finish adds to the aggresive look of the vehicle - could this TR7v8 be the closest thing to a 'rat' car that the wedge is likely to get? The 'rat' car is generally a powerful vehicle, finished in a dull, lustreless, black paint that sounds loud and goes like stink! So is it loud? With twin, straight through, exhausts and cherry bombs on the back it can certainly be classed as loud! If you've neighbours that wake you up early, or keep you awake late, maybe you can get your revenge! Does it go? With a 3.5l v8 pushing out around 200 horses, I think we can comfortably say it would go - there'll be faster TR7v8's out there but with 200bhp on tap I think you'd find there's enough power to give you an interesting drive. The car itself left the Speke factory sometime in 1976 or early 77, however there's been a bit of mix n match over the years as evidenced by a tartan trim seats - which would suggest a little taste of Canley in there somewhere. In early July 2004 this car was for sale on Ebay UK - with the reserve not met the owner was open to offers and, at the time of putting this page together, he was hoping to negotiate a sale with one of two interested parties. 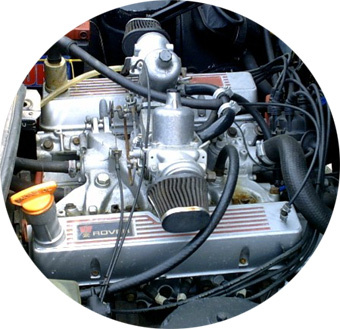 The car did need finishing off and a bit of work for the MOT was required but nothing major and certainly nothing that would cause too much hassle for the home mechanic. Thanks to Tony for the pictures (larger images here) and info - I hope you get a good price! If anyone is interested in the vehicle contact me in the first instance and I will pass on your details.